Korg created the world’s first hand-held tuner back in 1975. Since then, tuners have become a widely used item among musicians. Korg has continued to lead the way, creating a succession of revolutionary tuners featuring new technology and new ideas. 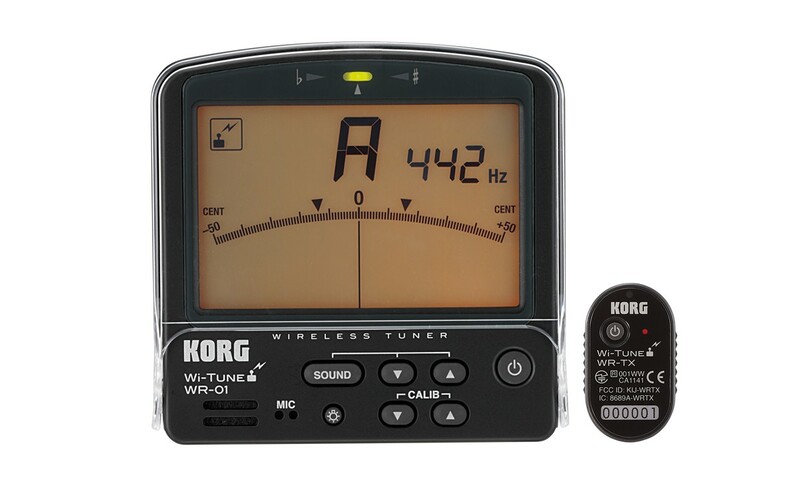 Now, KORG announces the world’s first wireless tuning system; the Wi-Tune. 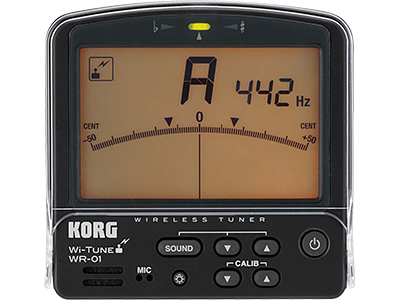 Using Korg’s Wireless Tuning System, the Wi-Tune allows you to tune any instrument in any situation, unobtrusively, accurately, and easily. Our Wi-Tune systems are ideal for instruments such as sax, clarinet, flute, horn, or tuba; instruments where using a traditional tuner could be problematic. Wi-Tune eliminates these obstacles, allowing new avenues for practicing. Wi-Tune wireless tuning is also discreet, and can be used in nearly any musical environment. Wireless tuning – no cable required! 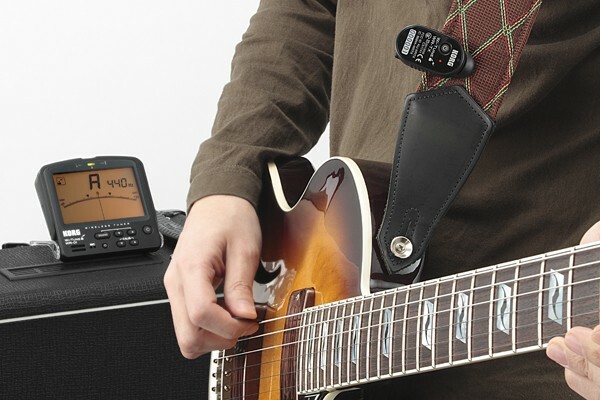 The transmitter clips to your instrument and sends the signal wirelessly to the tuner! The large backlit LCD offers excellent visibility, even at a distance. The newly designed meter follows even slight changes in the sound, and provides a large note name display. The integrated cover/stand allows the tuner to be placed on a music stand, table, or on the floor to accommodate any situation. o WR-01: Regular & small clips for guitar, brass and woodwinds o WR-01S: Includes strap for use with Saxophone, clarinet, etc. Markings indicate pure major third and minor third intervals for exceptional ensemble harmonies. Designed to provide environmentally-friendly extended battery life. There are two Wi-Tune packages; the standard WR-01 and the WR-01S. Simply choose the package that’s most appropriate for your instrument. The WR-01 includes a regular clip that fits a wide range of instruments and a small clip for brass band or orchestral instruments. Both clips represent an improvement on the clip design of our best-selling AW-2 clip-on tuner. 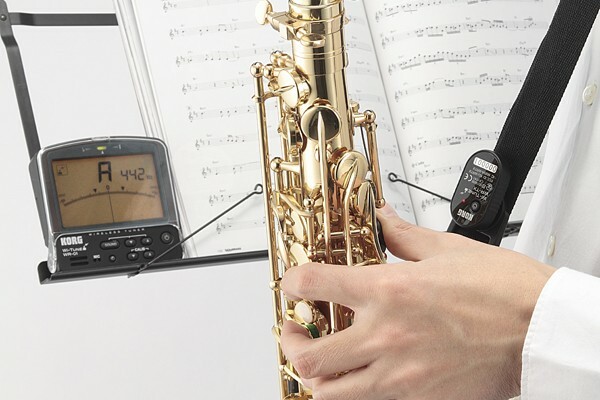 Also available is the WR-01S model for sax and clarinet, which allows the tuner to be attached to the strap rather than directly to the instrument itself, so as to not obstruct or interfere with tuning the instrument. Select the attachment method that is most appropriate for your instrument’s shape or your situation, ensuring optimal fit and maximum freedom. Pitch variance and note name are shown in the large liquid crystal display for excellent visibility. Built-in backlighting assures tuning with confidence, even on a dark stage – or at a distance. The wireless status and the remaining battery amount are also clearly indicated by icons, providing this important information at a glance. Designed for eco-friendly long battery life, this system is the perfect tuning assistant. The main tuner body has a built-in mic, you can also tune without using the transmitter. 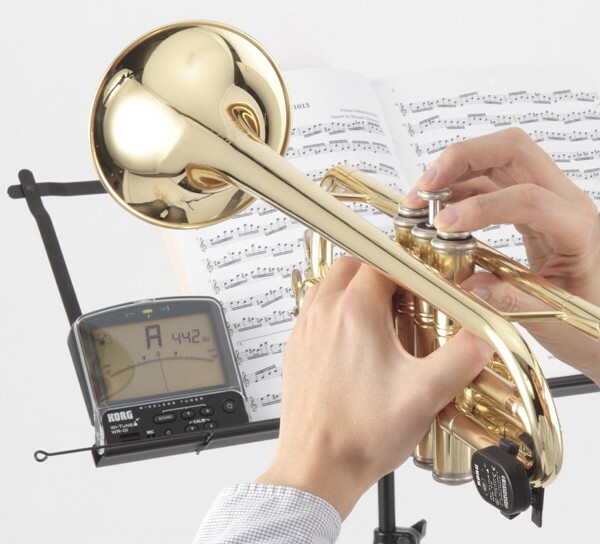 The tuner also provides a Sound Out mode that produces an audible reference tone from the internal speaker, which you can use when tune by ear, or for ear-training practice. Inaccuracies of the harmonies in a triad are particularly easy to notice when played by an ensemble such as a brass band or orchestra. By slightly adjusting the pitch of a major or minor third relative to the equal-tempered interval, a beautiful-sounding pure third can be obtained. The meter scale of the Wi-Tune includes markings to indicate pure major and minor thirds relative to a specified pitch. Simply by tuning your instrument to these markings, you can perform beautiful, pure harmonies when playing in an ensemble. * The choice of note to adjust when tuning to a pure major or minor third will depend on the music you’re performing.